1. Sign in to a Gmail account. 2. Click the small arrow icon at the top right corner of the page or the picture and than click Add Account button. 3. 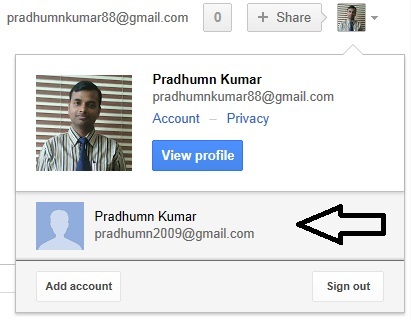 Now fill your login details of another Gmail account and than click Sign In. 4. Once you are signed in to more than one account in same browser, you can either switch between your email accounts on the same tab or can also open your email accounts in 2 different tabs. 5. To open another account in same or another tab, just click your email ID or small arrow at the top right corner of the page . 6. And than click the Email ID you want to open on that tab. 7. 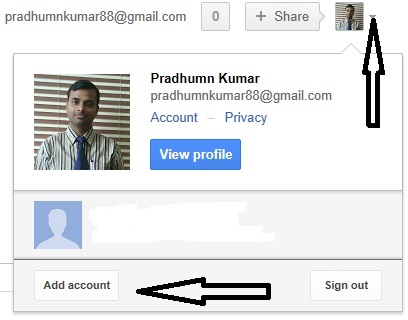 Using this method you can add upto 10 Google accounts and than can easily swtich between them. This is the best way to save time and effort while using multiple Gmail accounts. using different email accounts in a browser is very easy for me now after visiting your blog,thanks for this informative blog post.